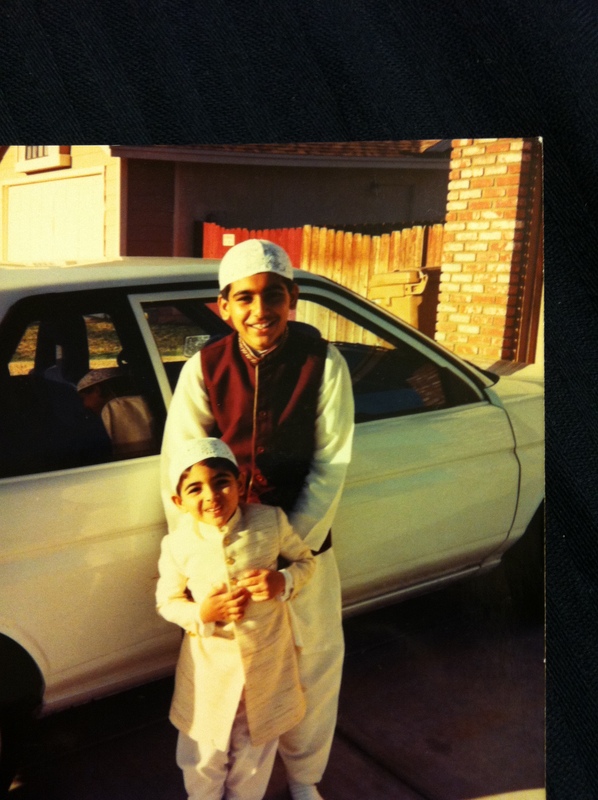 Eid circa March 1994, I didn’t want to dig up older pictures and took the first snapshot I found of myself and my little brother… just a quick stroll down memory lane. Ramadan is a guest, it comes into the lives of Muslims each year, and like a house guest, it makes it self either a pleasant and welcome friend or a friend you can’t wait to get rid of. The thing about Ramadan is that the interaction with this friend is all on you- each individual makes what they wish out of the experience. What makes this particular Ramadan harsh is that its occurring during what will be the summer months for those in the northern hemisphere of the Earth. The fasting will be up to 14 hours some days, to add to the length the intensity of thirst will be amplified by the heat. Here in Southern California we will be experiencing temperatures up into the triple digits. Ramadan, like most days for Muslims, starts at sunset. So the first day of Ramadan begins on the sunset of the current (Western) day that we are in. The first day of night prayers starts tonight. The first time I started to fast was when Ramadan was occurring during the summer months; I remember those first couple years of Ramadan being brutal. In particular I remember coming back from school and sneaking in some food and drinks to help me make it until the first night prayer came in after sunset. Here I am some eighteen years later, another cycle of summer Ramadan’s- Alhumdulillah (All praise is due to God for allowing me to make it in my life to see the summer Ramadan once more.). I don’t know about you but I tried to fast a few days over the course of the past month. I didn’t do to well. But I am not willing to loose out on the opportunity that Ramadan provides. So its going to be buckle down and double down time for me. The scholars tell Muslims that the first ten days (Usually Ramadan is a month that contains 29 or 30 days) of the month of Ramadan are “the days of ‘Rahma‘”. Rahma in Arabic means “mercy” and for Ramadan the first ten days are about “mercy”- so what is exactly is mercy? 1. Compassionate treatment, especially of those under one’s power; clemency. Which tells me that for Ramadan its a good time to focus on how one interacts with others, generally having a kind and forgiving disposition and being as helpful to others as possible. But the thing about MERCY is that one should be that way with one’s self as well. So I encourage you to join me as I explore the concept of MERCY in Islam during the first ten days and move on to the next two sets of 10 days, the second set being the DAYS OF FORGIVENESS and the last 10 days being the DAYS OF SEEKING FREEDOM FROM HELL. RAMADAN KAREEM! I pray that your Ramadan is going to be a pleasant one, that you set your goals and achieve them and that everywhere there are Muslims suffering, especially those in Cambodia and Syria, they experience the utmost Mercy from God during this blessed month.